The kids dropped off little Belle Friday night for my first “Grammy” babysitting gig!! Love this little girl!! Wow super cute picture of you “grammy”! And look at the little baby angel Belle! Kiss and hug her for me! So sweet! It is wonderful and we must take advantage of EVERY opportunity don’t we?! I can’t believe how quickly Belle and Olivia are growing. Love ya friend!! You’re right Robin – we know how fast time flies!!! Love you too buddy! 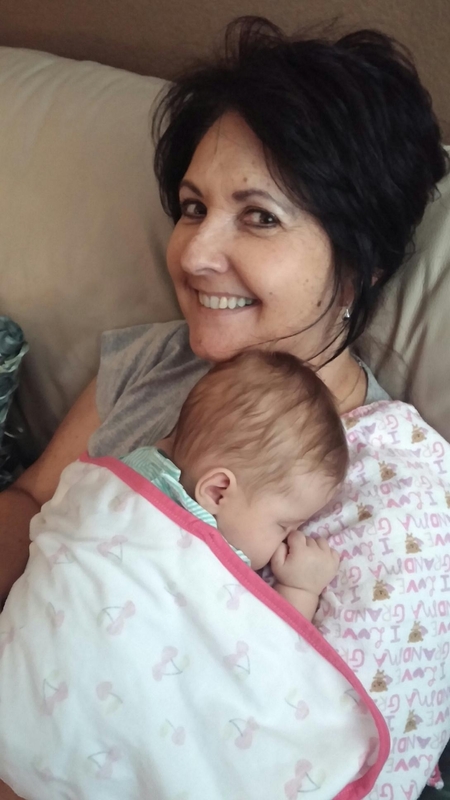 Cute picture of Grandma & baby Belle! Can’t believe you are a Grandma! LOL seems like just yesterday YOU were that age!! Hey girl! Thank you and it IS sooo crazy how fast time goes!! I remember Grandma Weaver always saying that to me! Love you!